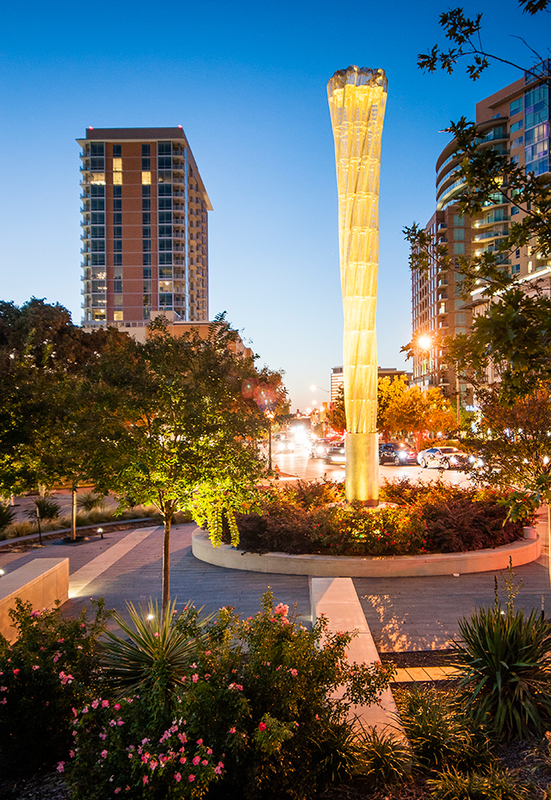 The City Place development includes three unique sculptures as part of an initiative to promote walkability by beautifying the surrounding landscape. The permanent installations installed October 2011 visually anchor the site, becoming landmarks within the development by compressing space to a pedestrian scale. As landmarks they also serve as fixed markers against the variable backdrop of the ever-surrounding urbanity. 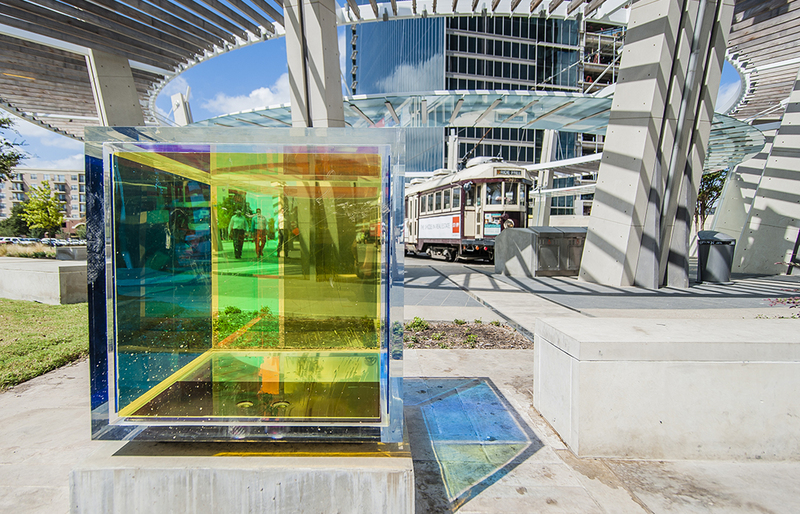 The first of these installations is nestled between the McKinney Avenue trolley turntable and the DART Station. Titled Synchronicity of Color Receptors, these two colorful glass cubes are the work of artists Margo Sawyer. Only a short distance away at the corner of the McKinney Avenue and Blackburn Street is Watertable, a 12-ton piece of black granite by sculptor Brad Goldberg. The third installation, a work by Cliff Garten titled Tower II, is visually present soaring 35 feet in the air. All three artistic pieces have dynamic qualities, modulating light and water, making them intriguing both day and night. While these sculptures have a distinct beauty as autonomous objects upon first glance, a supplementary appreciation is gained experiencing them over time on a multitude of occasions. In this way an insight unfolds as the observer accumulates experiences that are layered in the mind’s eye. These gained perspectives bring a new connotation, one pertaining to human interaction with environment. As the sculptures redefine the surrounding space, they are no longer just independent monuments juxtaposed with the ever-changing landscape, but are sewn into the fabric of the site. Perhaps to the pedestrian this becomes the greatest benefit: an artwork so engrained with place that it serves to trigger memories of the past. Linsday Brisko, Assoc. 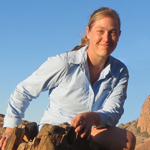 AIA is a project coordinator at Good Fulton & Farrell.